One of the significant urban features of India is the permanent HDPE tank on buildings. Usually black but with an assortment of colours including a somber black, a bright blue and a brilliant yellow with a shining white also thrown in. This reflects the water and electricity reality of cities, intermittent supplies of both which means storage is the only way that 24/7 supply can be ensured. There is another ubiquitous structure which is also present in most buildings but which goes unnoticed because it is below the ground and hidden from view and that is the sump tank. Since water is not provided for construction purpose by the water utility the first construction on a site is an underground water storing tank called a sump. This sump is built even before a watchman’s shed sometimes. Here water will be purchased from private water tankers and stored to be used for construction. One estimate has it that there a million sumps in the city alone with an average capacity of 6000 litres. This means that the water storage capacity created is a staggering 6000 million litres. Remember that the city gets in about 1000 million litres every day. Added to the fact that there is about 1000 million litres stored in overhead tanks the water storage by the city far outstrips that created by the utility. Once the construction is completed the very same sump tank will be used to store the intermittent supply from the water utility. From here a pump will send it to the overhead tank to be reticulated by gravity to all the water points in the building. Usually the sump tank is located in the North East corner of the site, especially for those who believe in Vaastu. The overhead tank is located in the South West for that is supposed to be the highest point of a building. Beliefs aside there are many technical things that should be carefully thought through to ensure that the sump delivers efficiently what it is supposed to. The sump should be based on firm earth and with a good bed concrete. If the soil below is clayey or non-homogeneous it is better to build a RCC raft slab below. The side walls should not be compromised on and should be with good brick work using a nine inch wall. Alternately concrete blocks or hollow concrete blocks of good quality can be used. In high water table areas or areas of loose soil both sides of the wall should be plastered. The inside of the sump tank wall should be plastered with a waterproof compound on a wire mesh base. This will ensure that the sump tank does not leak. After it is built the tank should be filled with water and checked that there is no leak. Any leak should be detected and fixed immediately. 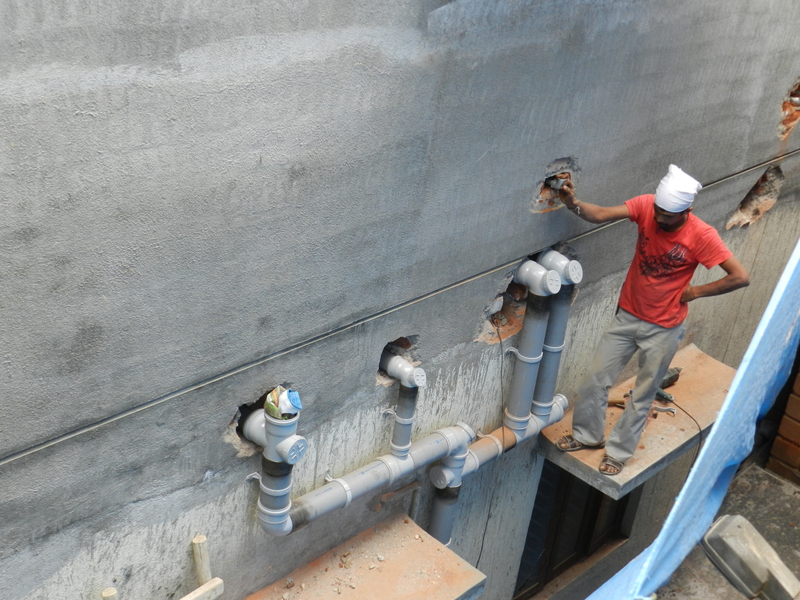 Sump tanks are extremely unsafe spots on a site especially for children of construction workers and for others. They should immediately have a cover slab cast with an inspection cover securely locked. The sump cover should be rust proof. Aluminum covers are now available which are excellent. The other things to remember are to use a submersible pump which is energy efficient. The submersible pump will save space being inside the sump. The pipeline from the sump to the overhead tank should be as straight as possible and with as few bends as possible. PVC or GI pipes of the right gauge and size should be used. A ball valve regulates the water intake into the sump. This should be of good quality and should function effectively. 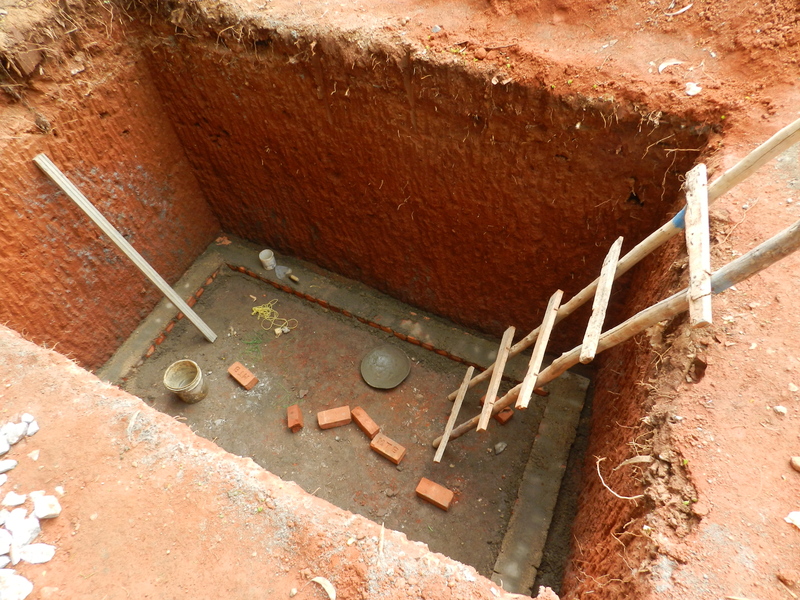 In Bangalore the sump can also double up as a rainwater harvesting structure thus being multi-purpose in use. During the rains rainwater and during the non-rainy season water from other sources can be stored. While digging in most places in the city good red earth will be obtained. This can be used for gardening and even for the making of earth blocks for the building. An annual cleaning and maintenance is recommended preferably without wasting the water inside it. During summer and during water borne disease outbreaks it is best to dose the sump water with bleaching powder and to measure the residual chlorine as 2 mg per litre after about 4 hours of the dosing. This will keep waterborne infections like cholera at bay. Even though hidden from view the sump tank has an important role to play in the use of a building. A good design and maintenance will help extend its life and for it to perform optimally. In this understanding lies water wisdom. The crisis of plumbing, where are the skilled plumbers? Everyday miracles occur in our homes and apartments daily and yet we are oblivious to it. You open the tap in the kitchen sink and fresh clean water flows from it to wash the vegetables for cooking. You go and use the toilet and the flush takes away the waste from your sight cleanly and into a vast underground network of pipes which hopefully will then clean it up in a sewage treatment plant somewhere at the end of it. If anything distinguishes a civilized world from a less civilized one, it is plumbing. The provision of treated piped water inside homes and the taking away of waste-water has been the single largest lifesaver ever, decreasing mortality , increasing life span , reducing morbidity and improving quality of life overall. The great cities of the world are those which have built water supply networks bringing potable water home and underground sewers capable of handling all wastes including for a growing population. The invention of the flush toilet, which many regard as one of the world’s greatest inventions, also called for skilled plumbers to connect them to the sewage systems emerging. From the days of Harappa and Lothal circa 2500 B.C.E or thereabouts, when the cities had a good sewerage and drainage system, to the current day’s plumbers seem to be a non-formal, ‘learn on the job as you apprentice’ trade. Great cities were built in the past and disappeared into the mists of history. Presently a construction boom grips our cities and yet one of the most crucial jobs that of providing water remains in the hands of a trade where there is no formal training institution and which has not professionalized itself. The most expensive fittings in the market for taps , showers , baths and flushes are put in place by untrained hands. While it is true that skills not necessarily have to be learnt in formal institutions yet that there is no single poly-technic which teaches plumbing as a formal course to those wanting to enter the job market looks like a missed opportunity for the construction sector. There is also a great need to improve the skills of those who are already in the trade and who would want to take their income earning opportunities to the next level , perhaps even as as contractors or entrepreneurs. Skill training for plumbers will improve the efficiency of design of buildings, improve water and sanitation handling abilities, ensure fire-safety and ensure the increased life of buildings since leaking water and sanitation lines are one of the biggest culprits for the reduction of life of buildings. Leaking pipes cause fungus and mold to develop and directly impact the health of the occupants. Blockages of pipes and sewers are a nuisance taking tremendous efforts to repair once a problem occurs. Meanwhile Babu goes about his work in putting in place a new plumbing system for the house recently expanded and a first floor built. He has been in the trade for 13 years. He uses the crudest of methods to heat and join pipes. He has no idea on say putting a siphon type rainwater drain-out pipe which can reduce the diameter of the pipe and thus reduce cost for the owner. He has no clue on how to build a rainwater harvesting system which can collect at least 100,000 litres of rainwater for the building annually. The joints of the drainage pipe are reasonably well done but he has no idea how to have a dual pipe system which can reuse grey-water from the building and recycle it. The building owner and the contractor trust him completely and therefore are condemned to a sub-optimal design for the rest of the life of the building. The Indian Plumbing Association, a newly formed body, has brought out its own code for plumbing including a Green Plumbers Code. It is valiantly trying to bridge the skill up-gradation and capacity building gap. They need the assistance of many a poly-technic and the skill up-gradation council of India to develop and deliver a special course to bring trained plumbers into the market. The construction sector will only benefit from such an effort as well as employment opportunities for the young in a trade which is life saving and very important. Water wisdom demands that society invest in skilled plumbers. That time is now. You are currently browsing the Harvesting Rainwater blog archives for October, 2013.